Flexible and paper-like with a stiff consistency, this cooking tool is used to flavor foods that are being grilled. 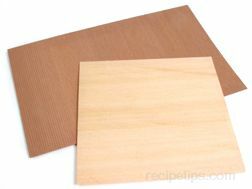 Typically made from a type of wood that would commonly be used for grilling such as cedar, a Grilling Paper will have a grained appearance, similar to a piece of wood. The Grilling Paper is manufactured in different sizes to accomodate larger and smaller-sized foods to be wrapped. Generally, the overall sizes of the sheets will be 6 inches wide and range in length from 6 to 12 inches. Prior to cooking with this wood wrap, make sure the sheets of Grilling Paper have been adequately soaked in water to keep the sheets from burning. To prepare, immerse the Grilling Papers to be used in a shallow dish filled with water. Place a weight such as a heavy glass item or a rock on top of the sheets being soaked to make sure the sheets are completly submerged and remain under water for 10 to 15 minutes. When ready to wrap around food, place the food so it is positioned in the same direction as the grain of the wood. Roll or fold the edges of the sheet toward the other side, bringing both sides together so they overlap as much as possible creating a seam running lengthwise down the center of the Sheets. If necessary to keep the sides neatly held together and overlapping, wrap kitchen or cooking twine that has been soaked in water around the Grilling Paper to secure the Sheet and keep it closed as much as possible. When using on the grill or in an oven, preheat the grill or oven to 400ºF and then place the wrapped foods directly on the grill grate or in a baking pan when cooking in an oven. The food should be cooked until done, which may be approximately 8 to 10 minutes while wrapped or 5 to 7 minutes if only being smoked. When foods are smoked using the Grilling Paper, the food does not need to be turned as it bakes within the Paper. In addition to the flavors added by the species of wood such as red cedar, more flavor can be added by soaking the Grilling Paper in substances that are commonly used to season wood chips used for smoking foods. Wine, whisky and sake are common beverages that can be used for soaking the Grilling Papers and Sheets in order to provide additional flavors to foods being baked within the Sheets.